The new ferry “Hebrides” entered service in February 2001. The second of 2 new ships built for Caledonian MacBrayne Ltd, during that year. The artist’s brief was to create a series of 3 paintings, one for the main saloon of the ship, one as a gift for either the builders or the VIP who named the ship, and one for the company offices, all to be complete before the new ship was built, in time for the naming ceremony. 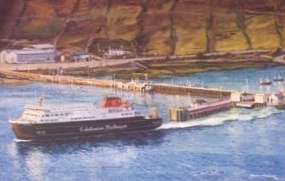 The artist was for a second time, the first being for the “Clansman” paintings, flown to Glasgow and met by the then managing director of Calmac, Captain John Simkins. Together they sailed on the triangle route to research for the paintings; from Uig to North Uist, (Lochmaddy) South Harris, North Harris (Tarbert). While Captain Simkins was busy with Calmac affairs the artist produced a series of sketches and photographs which they discussed on the voyage back to the mainland. The artist worked closely with the ship’s design team who also used him to advise on colour schemes for the ship. Several of the paintings included changes that were going to be made to the pier heads to accommodate the new larger ships. All this was successfully painted by the artist in time, in advance of the building being completed. Here you see one of those ideas developed into a small, delightful painting. People intuitively notice the difference, when the artist has been on location, including those who travel on the ships and see the originals. The Princess Royal (Anne) who knows the islands very well was very impressed by the “Clansman” paintings, she particularly noted the colouring and light was very convincing, that the picture was very detailed yet had managed to avoid the trap of becoming “photographic” or static; she commented that it was remarkably fluid, mysteriously convincing yet painterly. Princess Anne spent 15 minutes at the naming ceremony of “Clansman” talking to the artist and suggested that he should be encouraged to paint more Hebridean scenes. One result has been 2 further commissions from Calmac. While the artist can work very successfully from plans and photographs, there is a significant advantage in his seeing the locations when possible.